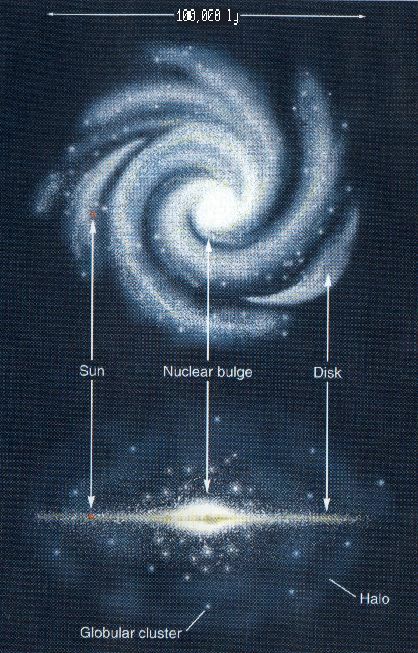 The nuclear bulge and Galactic Center. The Halo consists of the oldest stars known, including about 146 Globular Clusters, believed to have been formed during the early formation of the Galaxy with ages of 10-15 billion years from their H-R Diagrams. The halo is also filled with a very diffuse, hot, highly-ionized gas. The very hot gas in the halo produces a gamma-ray halo. Neither the full extent nor the mass of the halo is well known. Investigations of the gaseous halos of other spiral galaxies show that the gas in the halo extends much further than previously thought, out to hundreds of thousands of light years. 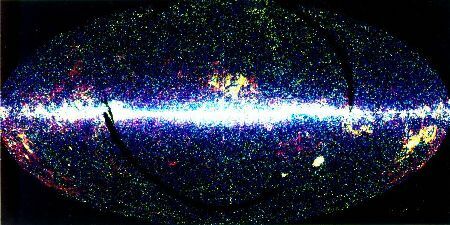 Studies of the rotation of the Milky Way show that the halo dominates the mass of the galaxy, but the material is not visible, now called dark matter. The disk of the Galaxy is a flattened, rotating system which contains the Sun and other intermediate-to-young stars. The sun sits about 2/3 of the way from the center to the edge of the disk (about 25,000l.y. by the most modern estimates). The sun revolves around the center of the galaxy about once every 250 million years. The disk also the galaxy about contains atomic (HI) and molecular (H2) gas and dust. Here is an excellent tutorial on the Shape of the Milky Way by Rick Arendt. 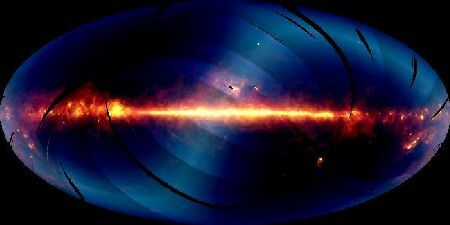 Stars in the Milky Way at Mid-Infrared Wavelengths (free from dust extinction - NASA/IRAS Image). 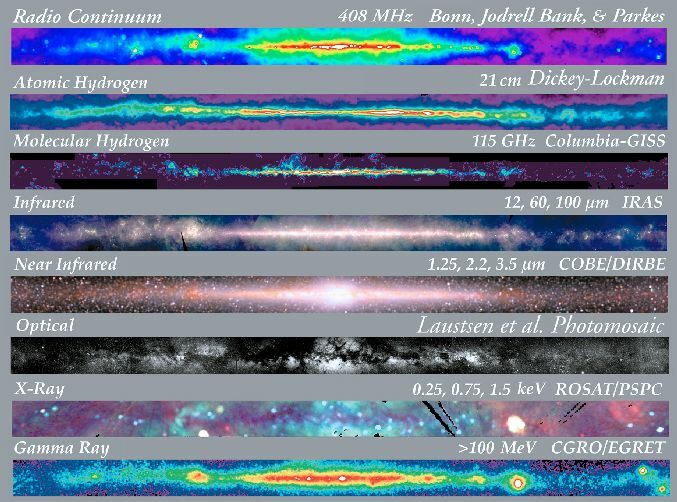 Request a free copy of the Multiwavelength Milky Way poster. COBE Infrared view. Since the Earth lies in the disk of the Milky Way, dust prevents us from determining the large scale structure of the Galaxy's spiral pattern beyond a few thousand light-years. Radio observations have detailed the structure of the gas in the spiral arms, but it is still not known if our galaxy is a normal spiral like our neighbor Andromeda, or a barred spiral like shown to the left. 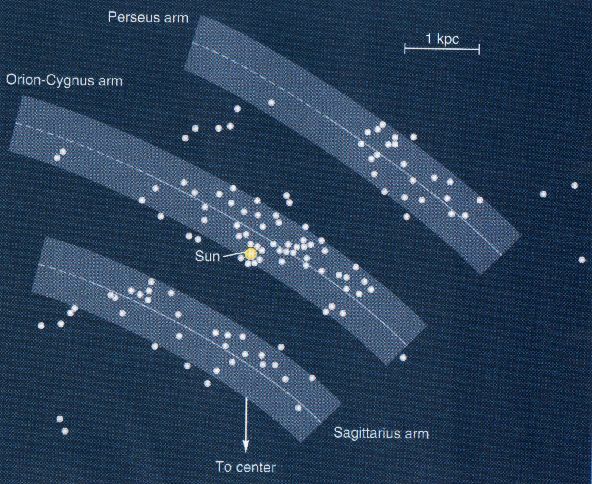 The bulge of the galaxy is slightly elongated in the direction of the Sun, which may be due to a bar. What lies at the center of our Galaxy? Again, dust obscures the visible light from us and we must use radio and infrared observations to elicit the nuclear properties of the Galaxy. A census shows us that the Galactic Center region is an unusually crowded place, even in this visible-light Map of Central region. At radio wavelengths, where we can peer down to the very center, we see the complex strctures shown in the 1-meter wavelength radio map made by NRL astronomers which is shown below. 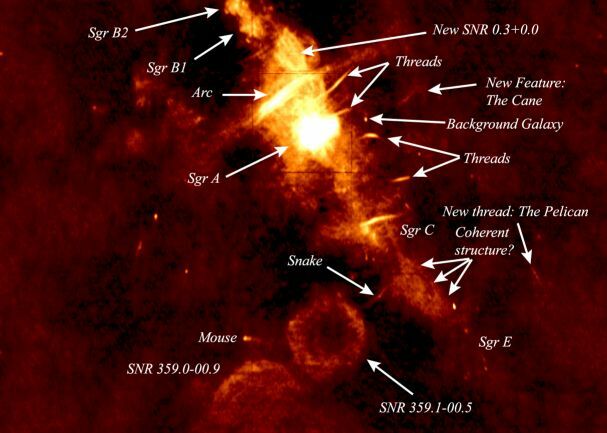 The map shows a region about 2000 light-years on a side; the center of the Milky Way coincides with the source marked Sag A (or Sagittarius A), which is actually three sources, a yound supernova remnant on the east side, an unusual ionized hydrogen region on the west side, and a very compact source called Sagittarius A* at the very center. Infrared light shows a dense star cluster which peaks at the center, near Sag A*. A collision every 106 years! Radio observations in molecular lines show a massive "molecular ring" of gas and dust that rotates around this star cluster. Extends from about 5 l.y. to 25 l.y. from the center. Shows evidence for shock waves due to explosive events in the recent past. 60 l.y. long linear structures tracing Galactic magnetic field lines. isolated star forming regions and supernova remnants. X-ray and gamma-ray observations show that the Galactic Center region is a strong source of x-rays and also gamma-rays from the annihilation of antimatter. X-rays from black-hole binary star systems and supernovae near the galactic center. 0.5 MeV gamma rays from a "fountain" of antimatter positrons from the Galactic Center region, perhaps the result of many many supernovae in the central regions of the Milky Way. Although there is no lack of fascinating questions about the Galactic Center, recent interest has been focused on the question of the possibility that a massive black hole exists at the center of the central star cluster. The presence of very high velocities in the stars and gas near the center of the galaxy has suggested to astronomers for a long time that a massive black hole might be present, providing a strong enough gravitational pull to keep the stars and gas in orbit. Andrea Ghez, a professor at UCLA, used the Keck 10-meter telescope at infrared wavelengths to measure the velocities of 20 stars that lie close to the galactic center over a three-year period. She found the stars are orbiting at speeds up to 1000 km/s (3 million miles per hour)! Observation done by scientists at the Max-Planck Institut in Germany have confirmed these results. This large gravitational acceleration requires an object with a mass 2.5 million times that of our Sun. The stars are located near Sagittarius A*, the radio source lying near the center of the galaxy. From its radio signal alone, Sgr A* did not have to be particularly massive, since its emission is not very powerful. Using the VLBA (Very Long Baseline Array) radio telescope, astronomers studied the motion of Sgr A*; they found a velocity of less than 20 km/sec for Sgr A* itself. This means it is very unlikely that Sgr A* is a single star or group of stars. 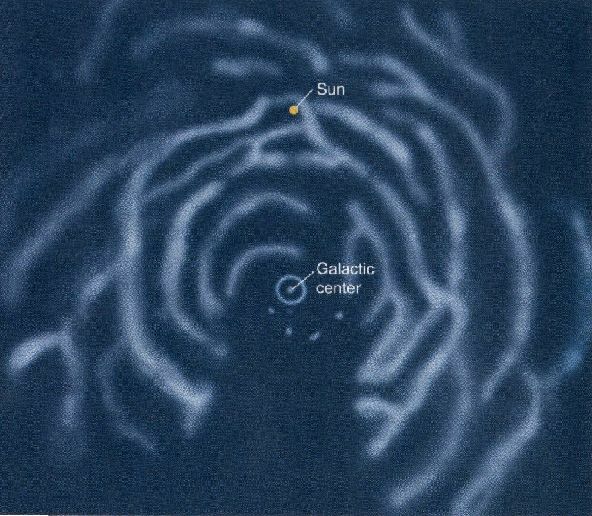 Only a very massive object could remain stationary under the conditions exisiting at the center of the galaxy. The evidence is mounting that Sag A* is indeed a black hole of 2-3 million times the mass of the sun. Astronomers speculate that the Black Hole is being "fed" by gas from the molecular ring, or supernova remnant. By consuming less than about 1% of the mass of a star each year, releasing gravitational potential energy, Sag A* can easily account for the high-energy phenomena near the galactic center. Take APOD's Journey to the Center of the Galaxy.